I learnt this week the sad news of the death of Barry Dawson, Emeritus Professor in the School of Geosciences at the University of Edinburgh. I had the great fortune to accompany Barry into the field in 1988, while I was still studying for a PhD, and had the pleasure of spending many enjoyable moments with him subsequently, whether in the field, at meetings, or just in passing. This seems like an appropriate time to reflect briefly on our first meeting. 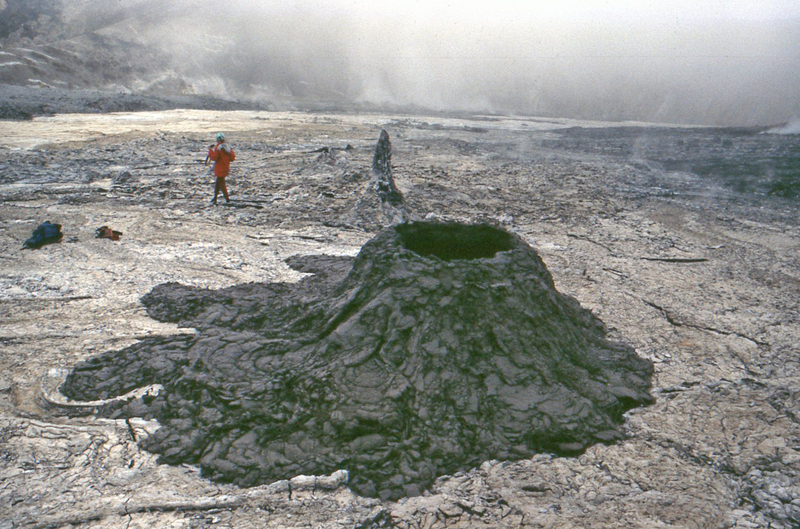 In the summer of 1988, Barry heard that a volcano that he had first climbed in about 1960 was erupting again, and he was eager to to put together a team for a field visit. This was no ordinary volcano, though: Oldoinyo Lengai, in the northern part of the Tanzanian Rift Valley, is the only known active volcano to erupt lavas of molten sodium carbonate (or carbonatite). With emergency funding in place from the Royal Society, Barry and I, along with Harry Pinkerton and Gill Norton, set off for Tanzania. 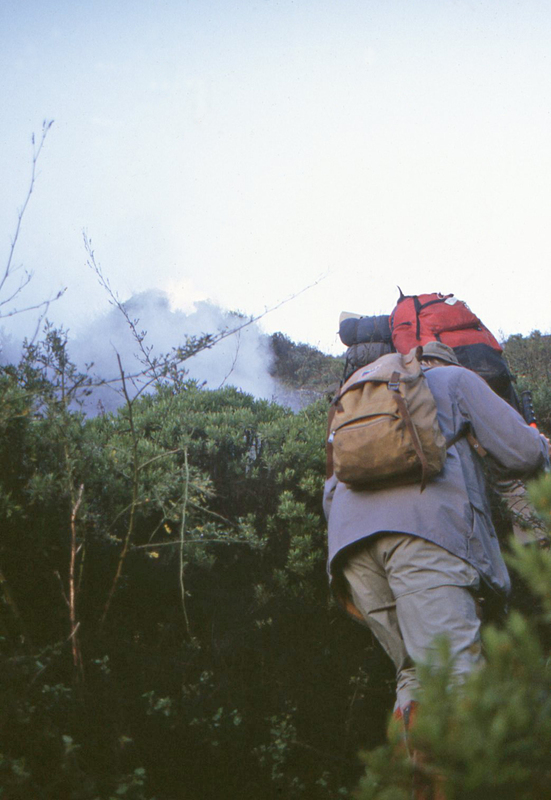 This was my first visit both to Africa, and to an erupting volcano. I remember Barry’s delight in regaling us with his reminiscences of his life in Tanzania as a Geologist for the (then) Tanganyika Geological Survey in the early 1960’s. This job had seen him map the ‘Monduli’ region of Tanzania, and had first taken him to the summit of this enigmatic volcano – and his first paper in Nature. Barry, always eager to pass on his knowledge and enthusiasm. We trundled across the rift valley in a ten-tonne truck, and set up camp at the base of the volcano. This was luxurious field work, with a team of guides, cooks and porters from an outfit, which is still going, called Dorobo Safaris. Getting to the top was a challenge, even with a safari team to carry most of the equipment, but it was certainly worth it: to see, first, sunrise over Kilimanjaro, and then to arrive at the rim of the active crater, shrouded in mist but with the full cacophony of an eruption in progress coming up from somewhere beneath us. Eventually, the clouds lifted, and we were treated to a display from the coolest (literally) and most fluid lavas ever seen on Earth. The next few days are a blur, but included Barry plane-tabling to produce a map of the active vents of the summit crater; impromptu tutorials on the alkaline igneous rocks (of which Oldoinyo Lengai is built), and many hours watching the astonishing eruptive display of this bizarre volcano. And once it was too dark to stay in the field, we would retreat back to the camp site which, in hindsight was perilously located within the main crater, to enjoy a wee dram and a story or two with Barry. 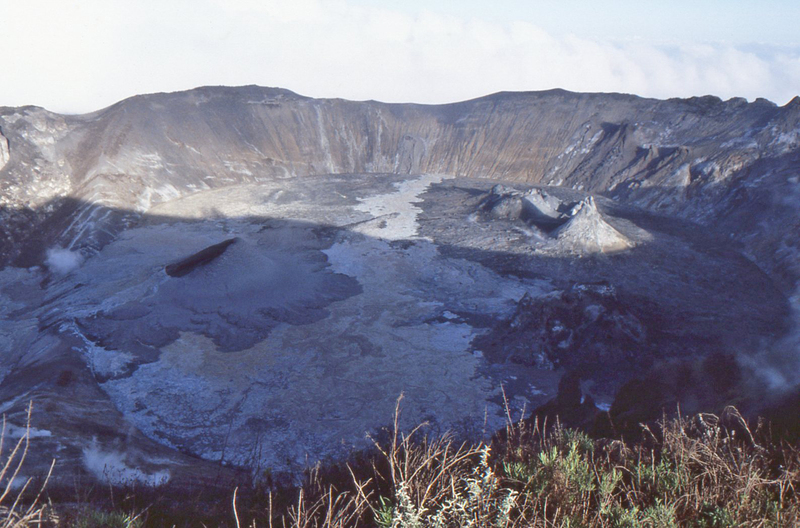 Early morning shadow across the active crater of Oldoinyo Lengai, November 1988. A curious little spatter cone of carbonatite lava, within the active crater of Oldoinyo Lengai. Five days later, we stumbled and slid our way back down the slopes, and took the dusty track back into Arusha. Arriving at the hotel to find that there was neither running water, nor food, wasn’t the slightest nuisance to Barry, who settled us all down in the bar to quench our thirst with beer. 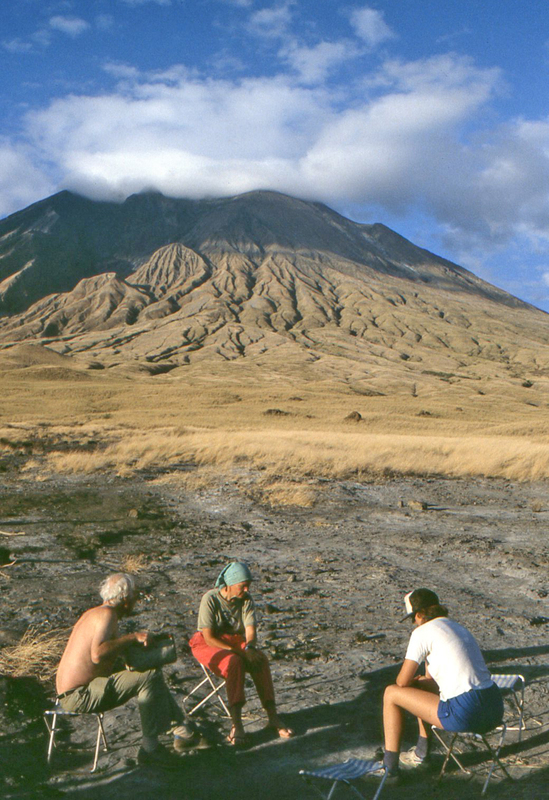 View of Oldoinyo Lengai from base camp, with Barry Dawson, Celia Nyamweru and Gill Norton, November 1988. Since that first field expedition, our paths crossed on many occasions. 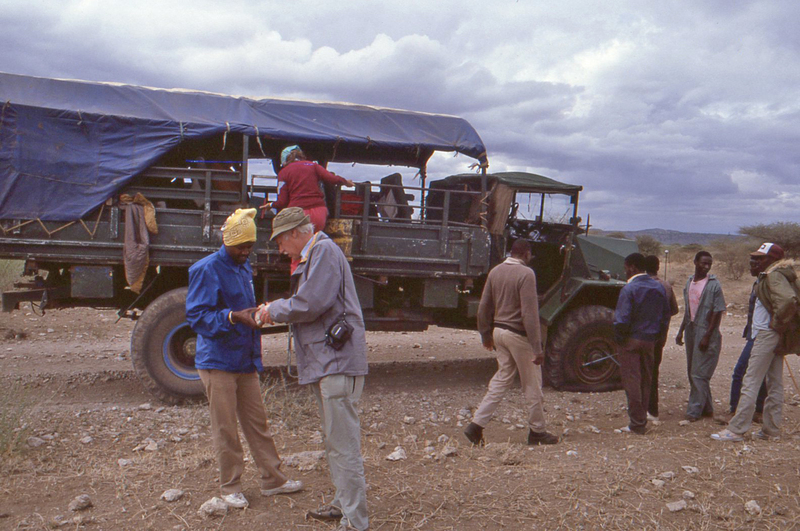 Barry was not only delightful company, he was hugely generous with his time, his expertise and his rock collection – a collection which must be one of the most important collections of both rocks from the mantle, as well as the East African Rift. I shall never forget the way he would always begin a conversation with ‘Now, David, let me tell you… ‘; my only regret is that I didn’t have time to go for a beer with him on my last fleeting visit to Edinburgh. Below, I have reproduced the formal citation that I put together for Barry’s nomination for the Collins Medal of the Mineralogical Society, which he was awarded in 2012. This hopefully captures a small snapshot of his academic contributions. Barry Dawson was a petrologist and mineralogist who devoted his career to further the understanding of igneous rocks. 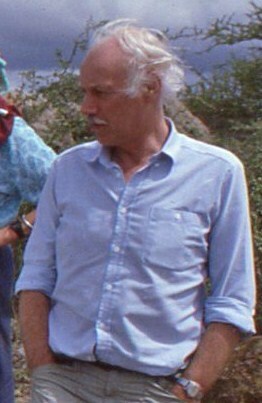 Over the fifty years of a highly productive career, Barry Dawson made a series of lasting contributions to studies of the mineralogy, mineral chemistry, petrology and geochemistry of the parts of the mantle sampled by volcanic rocks; and to the nature of the melts and magmas involved in continental magmatism. His work significantly developed the fields of kimberlite and carbonatite magmatism and improved our understanding of the nature of the subcontinental mantle. Barry Dawson’s career began with a PhD at the newly formed Centre for African Studies in Leeds (1956-1960). Here, he began his work on kimberlite magmas and their xenoliths, which culminated in the publication twenty years later of the influential monograph ‘Kimberlites and their xenoliths’ (Dawson, 1980). Amongst his major contributions here were his recognition of wet, pegmatitic rock samples from the upper mantle (the Mica-Amphibole-Rutile-Ilmenite-Diopside or MARID suite); and the discovery of diamond in garnet lherzolite nodules (Dawson and Smith, 1975). 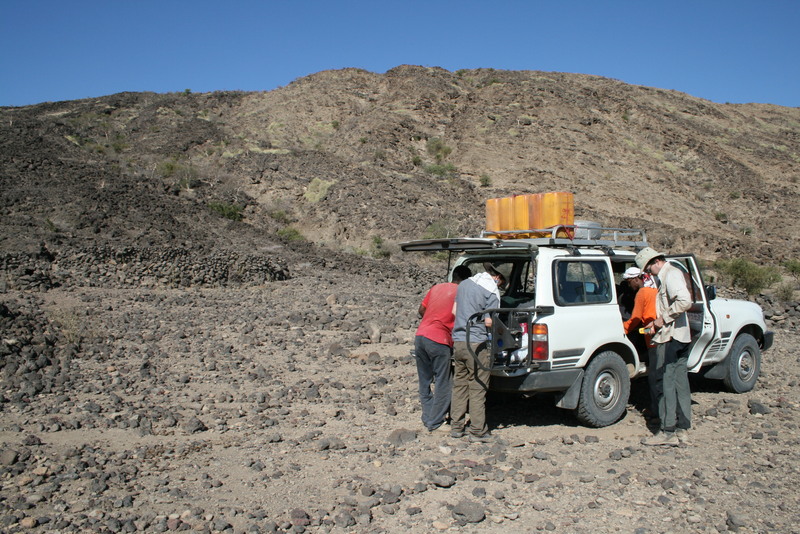 After completing his PhD, Barry worked for as a geologist for the Tanganyika Geological Survey, where he discovered the erupting sodium carbonate lavas of the volcano of Oldoinyo Lengai – aspects of which he continued to work on ever since. Barry returned to the United Kingdom in 1964, where he was lecturer at St Andrews and later Professor in the Universities of Sheffield (from 1978) and Edinburgh (from 1990). Over the course of his career, Barry published prolifically, and gave his time and samples generously to support the developing careers of his students and other scientists. He was a fount of knowledge on East African magmatism, and in his retirement, Barry completed an important synthesis on this, published in 2008, as a Geological Society of London Memoir titled ‘the Gregory Rift Valley and Recent volcanoes of northern Tanzania’. Barry’s notable achievements were recognized by a number of awards: he was elected Fellow of the Royal Society of Edinburgh in 1973; was Hallimond Lecturer of the Mineralogical Society in 1980/1, and was awarded the inaugural Norman L Bowen Award of the American Geophysical Union in 1987 for his outstanding contributions to volcanology, geochemistry and petrology. In 2012, he was awarded the Collins Medal of the Mineralogical Society for his career-long contributions to the field. Time to move scientific debate into the open? 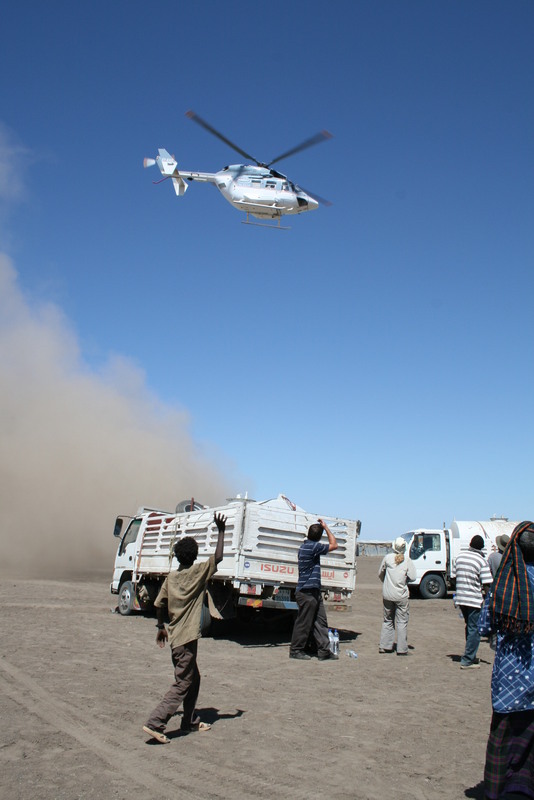 A few months ago, I got a routine request to review a paper about the fate of the plume formed during the 2011 eruption of Nabro volcano, Eritrea. The topic looked interesting, and so I agreed and duly reported. A few weeks later, the journal asked if I might write a commentary to introduce the paper, essentially as a bit of advertising. It wasn’t too hard to agree to that either; after all, you don’t often get the chance to write short opinion pieces for journals, and this was an area where I had a few things to say. So I duly wrote a short piece on ‘small volcanic eruptions and stratospheric aerosol‘ and it went live a few days later. Within a matter of days, the journal editor emailed again. Someone had submitted a comment on my piece, and the editor wished it to be corrected. My first instinct was surprise – I had written an opinion piece and I thought I had been quite careful in checking the facts. But the comment picked up on a single throwaway statement in the discussion. In my original article I had widened the discussion about the Nabro plume to bring in the interpretation from a recent paper in Science which had suggested that atmospheric circulation, related to the Asian monsoon, may have helped to loft the initial volcanic plume from the upper levels of the troposphere into the stratosphere. I perhaps gave way when I should not have done, but duly wrote a correction (corrigendum) to clarify the point, and that was eventually published. Now even though my commentary and correction are all in the public domain, there is no record of the discussion that went on behind the scenes. The originator of the comment is not identified, and the comment that prompted the correction was not published. This week, however, it has all become a little clearer: a pair of formal comments to the original Science paper, and a reply, have now been published in Science. The comments were submitted in August, about the time that my original piece came out – which explains why the rebuke arrived so quickly. But of course, as is usual with these things the comments and reply illuminate the problem (did the Nabro plume reach the stratosphere of its own accord, or not?) but not the solution. The whole process of writing the response, checking the proofs and signing the copyright forms to write a one paragraph response to an anonymous comment on what was only ever intended as an opinion piece took a few weeks of to-and-fro. This seems both rather archaic, and unneccessarily formal, compared to the ease with which one can have civilised and informed debate in blogs and other social media. Is it time for journals to move this sort of ‘comment’ and ‘reply’ out of the constraints of formal ‘publication’, and into the public domain? 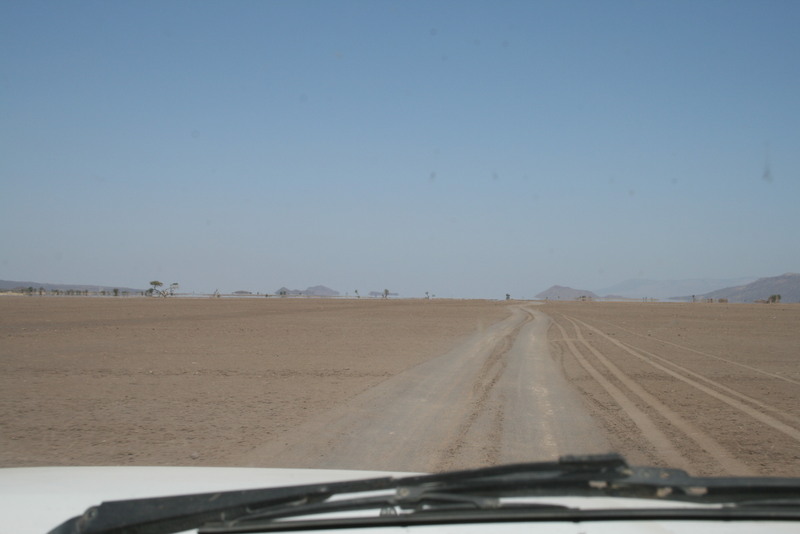 Looking north, up the Dabbahu rift, Afar. 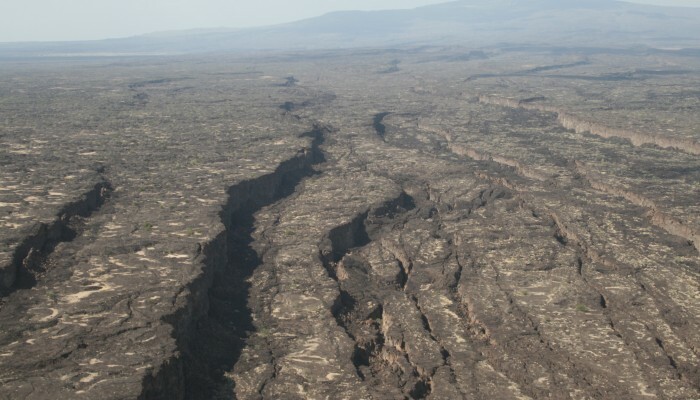 Aerial view, looking north along the Dabbahu-Manda-Hararo rift, Afar, Ethiopia. The stratovolcano, Dabbahu, lies in the background. Our new work shows that this rift is opening at about 20 mm/yr. Over the past 200,000 years, opening of this part of the rift has accounted for all of the motion between the Nubian and Arabian tectonic plates. The topography of this rift is thought to be similar to that of the mid-Atlantic ridge. Note the prominent fault scarps that cut through young basalt lava flows. The rift axis, and locus of current faulting and magmatism lies to the right hand side of the photo. One piece of evidence that helped to establish the theory of Plate Tectonics in the early-1960’s was the recognition of patterns of magnetisation in the basalts of the seafloor that were symmetrical about the global oceanic ridge system. Fred Vine and Drummond Matthews recognised that this pattern had to be fixed in place as the lavas, that were erupted along the ocean ridge, cooled through a critical temperature (the Curie point). Below this point, they would become weakly magnetized, with a signature reflecting the local magnetic field. On long timescales (millions of years) Earth’s magnetic field changes in both intensity and direction, and it is the major changes in polarity, during which the field reverses, that lead to the striped ‘bar-code’ signature of magnetic stripes on the sea floor. In turn, the symmetrical pattern of this magnetic chart-recorder requires that most of these seafloor lavas are erupted in a narrow region at the oceanic ridge, which marks the point of separation between two tectonic plates. These observations led to the now well established theory that tectonic plates form at oceanic ridges, where magmas from the mantle below rise, and freeze to form the trailing edges of the separating plates. While these processes are well understood for the sea-floor, we still don’t have a very good idea of what happens when a continental plate begins to split apart to form a new plate boundary. Think of the analogy of pulling apart a Mars bar. When you start to pull it from both ends, a number of fractures start to form in the brittle chocolate coating. But at what stage does the stretching become concentrated into the one major fracture, and what controls where that fracture forms? To get a closer understanding of how continents break up, there have been several concerted research efforts in the north-eastern parts of Africa (notably Ethiopia and Eritrea) over the past few decades. These have teased out the geological and geophysical events of the past 30 million years as the Ethiopian Rift Valley developed, and evolved to its current status, with a ‘triple junction’ forming at the boundaries of three plates (the Nubian Plate, beneath north Africa; and the Somalian and Arabian Plates). 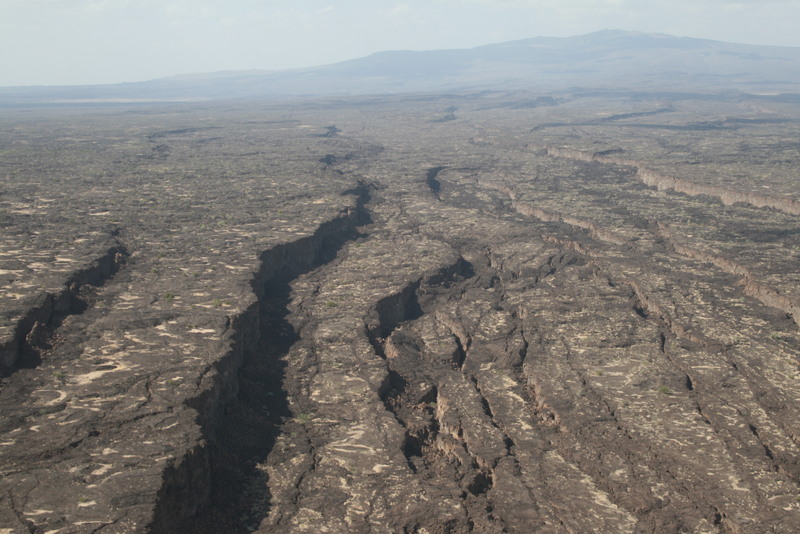 A part of this evolving plate boundary now lies within the Afar region of Ethiopia. This is an area that is both remote and challenging to work in, but also a place that is geologically and culturally fascinating. It is the location, for example, of the oldest Hominid fossils known including Lucy (Australopithecus afarensis). With the sort of serendipity that geological fieldwork sometime relies upon, an opportunity to re-examine how a continent breaks up arose in late 2005, when a major segment of the plate boundary ruptured. In a series of events which are now very well documented (see references at the end), the Dabbahu-Manda-Hararo rift lurched into life. Over the next six years, the rift has experienced at least 14 further rifting events, three of which were associated with eruptions of basaltic magma. 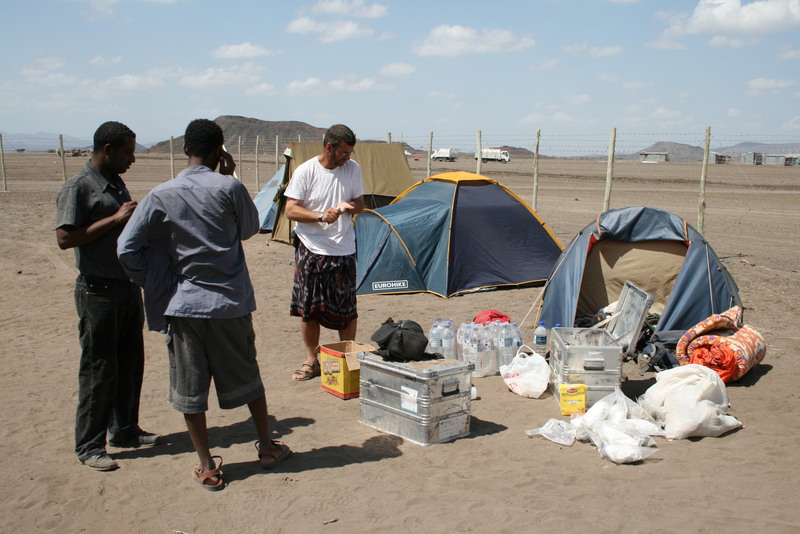 A multi-partner and multi-national research team has been working in the Afar since 2005, with the aim of using this active rifting episode to understand better how continents rift apart, and how new basaltic crust, which is typical of the ocean floor, begins to form. One part of this effort was undertaken by David Ferguson for his PhD research at the University of Oxford. David collected many samples of basalt lava from a section that crossed from the present active rift, and out onto the older margins of the rift. This meant travelling on foot, 4×4 and helicopter, and the collection of many hundreds of kilogrammes of rock, which were then shipped back to the UK. David then identified a small number of samples for dating, using the potassium (K) -argon (Ar) method. This method relies on the fact that all lavas contain small amounts of radioactive (and naturally occurring) K-40, which decays over time Ar-40. Since argon is a gas, is will naturally escape from lavas as they erupt; but once a lava is frozen, any Ar that subsequently forms by the decay of potassium will remain trapped within the finely-crystalline structure of the rock. By carefully breaking the rocks apart, pulling out the finely-crystalline fraction of the frozen melt and then heating the samples up in a controlled environment, David Ferguson and Andy Calvert, from the US Geological Survey, were able to extract and measure the tiny amounts of young Argon that had accumulated since eruption. Since we can measure the amount of potassium present in each rock; and since the rate of decay of potassium-40 is well known, these measurements tell us how much time that has passed since each lava sample erupted. As we might expect, David found that the lava samples got progressively older the further away they were from the presently-active part of the rift. But interestingly, the lava samples all have the same chemical signatures as the present day lavas that have been erupted from the rift – suggesting that each of the dated lava flows were also erupted from the centre of the active rift at the time. This may all sound a little bit obvious, but the conclusions are actually quite interesting: they tell us that for the past 200,000 years most of the volcanic activity in this part of Afar has occurred in a narrow rift, as we see today. The older lavas now lie a few kilometres away from the active rift – and this tells us the rate at which the rift has been opening over this period of time. Here, we find that the spreading rate of the Dabbahu-Manda-Hararo rift is about 20 mm/year (or about 4 km in 200,000 years). This matches quite closely with the independent estimates of the rate at which the Nubian Plate is separating from the Arabian Plate. So in this location, we can be fairly sure that main fracture of the ‘Mars bar’ formed at least 200,000 years ago, and this has effectively become the place where the trailing edges of the two plates are forming and pulling apart. So here we have it – the seafloor-spreading process, and the formation of new basaltic crust, identified on land. Reference: DJ Ferguson et al., 2013a, Constraining timescales of focussed magmatic accretion and extension in the Afar crust using lava geochronology, Nature Communications, 4, 1416. David Ferguson has now published a new paper in Nature that brings together information both from petrology (the nature of the erupted lavas, and their chemical compositions) and from seismology to develop a self-consistent explanation of the deep structure of the rift. This new work shows that the compositions of geologically young lavas requires them to have formed relatively deep (greater than 80 km or so), and at relatively higher temperatures than expected for ‘normal’ mantle. This can only be reconciled with other geological and geophysical constraints if the plate beneath the active Afar rift is still relatively thick. This, in turn, is consistent with the idea that the slow rate of spreading at the rift means that plate remains thick because of conductive cooling, while volcanism persists because the mantle at depth is suffiiciently hot to partially melt at depths just a little deeper than the bottom of the plate. In turn, this fits in with ideas about the long-lasting and slowly waning influence of a ‘hot spot’ or plume beneath the region, which is the favoured contender for the burst of magmatism in the region about 30 million years ago. Reference: DJ Ferguson et al., 2013b, Melting during late stage rifting in Afar is hot and deep, Nature 499, 70-73. Ebinger, C. et al., 2010, Length and timescales of rift faulting and magma intrusion: the Afar Rifting Cycle from 2005 to present. Annual Reviews of Earth and Planetary Sciences 38, 439–466. Wright, T. J. et al. 2006, Magma‐maintained rift segmentation at continental rupture in the 2005 Afar dyking episode. Nature 442, 291–294. Acknowledgements: this work was funded by NERC as a part of the Afar Rift Consortium. It would not have been possible without the excellent support of our colleagues, collaborators and logistical support teams in Ethiopia and elsewhere. We are very grateful to the people of Digdigga for graciously permitting us to share their school buildings and to set up a field camp in their village, and to the people of Digdigga and Teru districts for allowing access to the region.